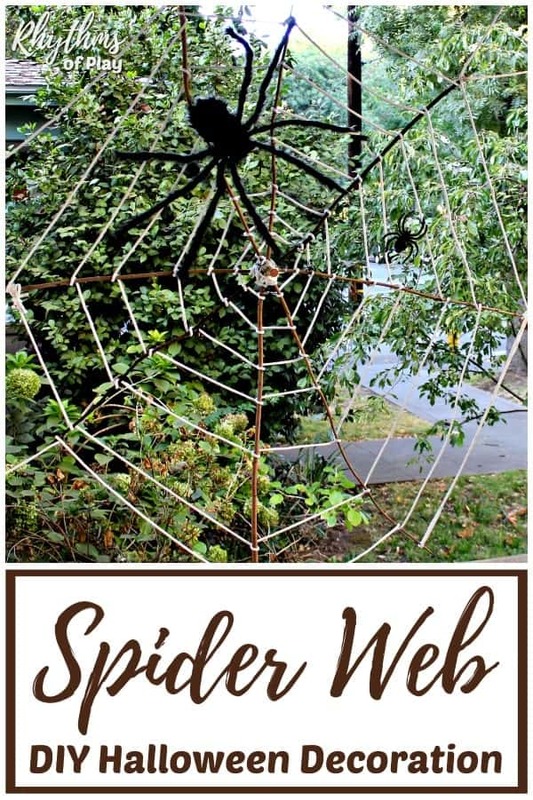 Learn how to make a giant spider web Halloween decoration for your front yard or porch this year. A fun and easy giant spider web outdoor decoration made with bare branches and rope that the whole family can weave and decorate together! 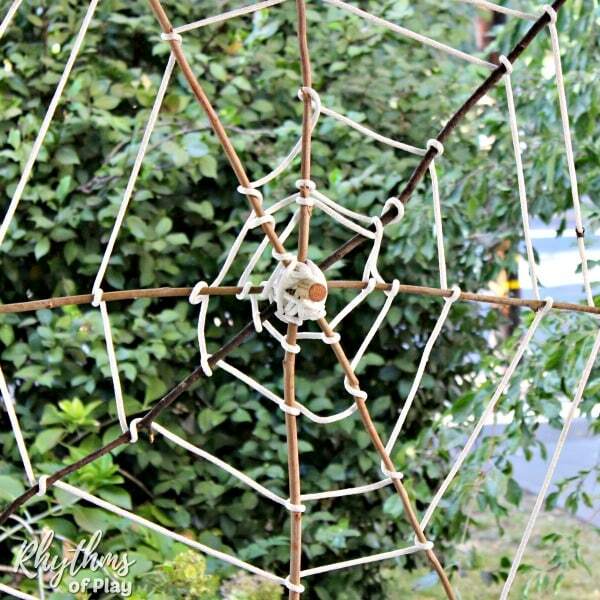 Make a DIY giant stick spider web Halloween decoration today! Our giant stick spider web was inspired by THIS Upcycled Halloween wreath made by Susie over at Twitchetts. When I saw her gorgeous creation, I knew I had to make a GIANT stick spiderweb to hang on our porch. For another fun spider web craft made with sticks, check out THIS stick spider web created by Penny at Mother Natured. We decorated our giant stick spiderweb with a large hairy spider, a medium sized plastic spider, and lots of little baby spiders. My daughter also hung some of our homemade spider egg Halloween decorations all around our giant stick DIY spider web, and we can’t wait to add another large spider with LED light-up eyes ! 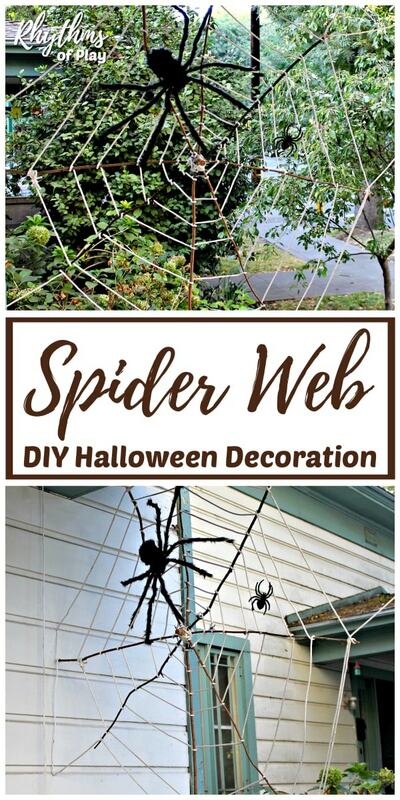 Read through the entire directions before you start making your giant stick spider web Halloween decoration DIY. Collect 4 long 3 – 8 foot sticks or bare branches and trim off excess leaves and twigs. Position sticks in a spider web shape. Drill the wood screw through the sticks one at a time to attach them together. We used a 3-inch wood screw that ended up being way too long. We hand screwed an old wine bottle cork onto the sharp end to protect our family from injury. Starting from the middle, do your best to weave and wrap the rope around the bare branches and sticks in a zig sag pattern until you have a nice sturdy center. Continue to weave and wrap the rope around the sticks in a spider web pattern from the center outward. You may need to re-weave it from the center outward a few times to create a nice firm web. Use a twisty tie, a zip-tie, a staple gun, or even a glue gun with glue sticks to attach the rope towards the end of one of the sticks in your web to finish it. Feel free to fasten the rope at different parts of the spider web using any one of the above options. The proper way to hang your giant stick spiderweb will depend on where you are trying to put it. Use a combination of more rope tied to the ends of the sticks, zip-ties and/or a staple gun to make sure it is well attached. We ended up weaving more rope around the ends of the sticks as we worked which made it even bigger and more awesome! 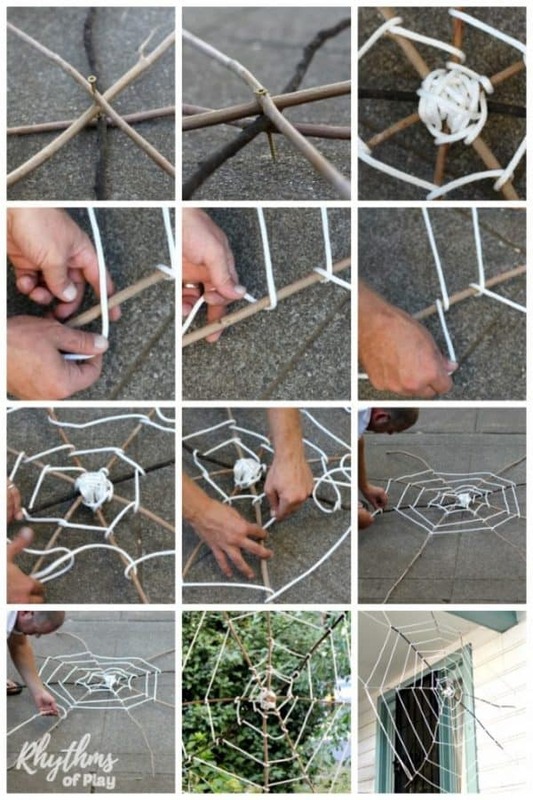 Learn how to make a giant spider web with this easy Halloween decoration DIY project. Making a giant outdoor spider web with bare branches, sticks and rope is a fun DIY Halloween project the whole family will enjoy creating together. 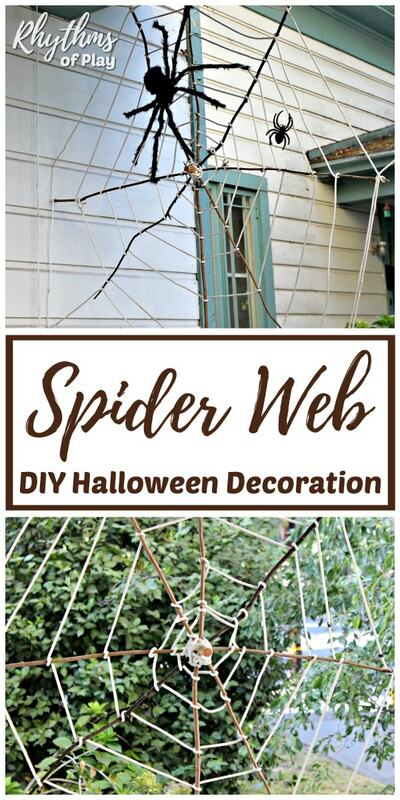 Weave and decorate a giant spider web for your yard or porch today! Don’t forget to check out our fall bucket list for the best autumn EVER. We have created a few more fun DIY Halloween decorations that the whole family can make. Use these fun Halloween decoration DIY ideas to decorate for both Halloween parties and your front porch or yard to entertain trick or treaters on Halloween night! This is so cool and it will definitely scare some of my friends. Thank you for sharing this cool idea. I’m so glad that you like it Susan! Thank you for the vote of approval!